For the past several months SCI Copenhagen have been working on a mission: We want to create a constructive diversity debate. We want women board members with chairman potential to step forward – and more women on boards. The mission was successfully launched at a major event on February 21, 2014 where the first winner of Women’s Board Award was announced. Stanton Chase International is famous for searching and recruiting executives for top positions. In this field, we are amongst the absolute top. But meddling in the political agenda and fighting for diversity in boardrooms – this is something that no other company like ours has ever done. For the past months Stanton Chase’s Copenhagen Office has secretly been working on the launch of a new award that focuses on diversity issues in Danish boardrooms. Denmark, which is otherwise internationally recognized for being a progressive country, is a slow mover in terms of diverse composition in top management teams as well as in boardrooms. And the debate concerning the issue is often full of clichés and platitudes. In Denmark less than eight percent of all board members are women even though 65% of the students in higher educations are female. This is one of the lowest numbers in Europe when it comes to gender diversity. The agenda of Women’s Board Award is to facilitate and frame a positive and constructive debate while bringing forth the best role models possible. On February 21st the first ever winner of Women’s Board Award was found and announced. 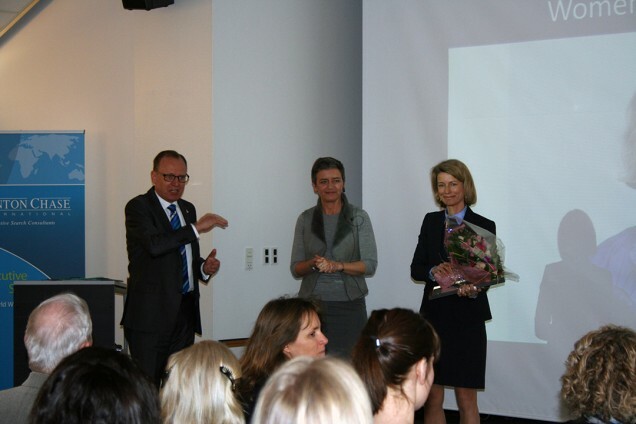 Eva Berneke, CEO of the Danish IT company KMD was awarded and celebrated in front of a large number of senior executives from the Danish business community. The award was presented by the Danish Minister for Economic Affairs and the Interior, Margrethe Vestager. “The award has come off the ground and put diversity on the agenda. It has received considerable attention from the Danish press and made analysts, commentators and opinion makers to really consider and discuss diversity,” says jury member and partner at Stanton Chase International, Janne Moltke-Leth. Prior to the jury selection of the three finalists, a comprehensive analysis of the 1,100 largest companies in Denmark and their women boardmembers was made by SCI Copenhagen. ”Through our extensive analysis it has become clear that the general perception that there are very few “women on board” at the major Danish Corporations is pretty close to the truth. But this doesn’t mean that they are not available. We certainly have a lot of work ahead of us – this is the beginning of a long process,” concludes Janne Moltke-Leth.